It’s hard to believe that almost one year ago, Drew and I were preparing to exchange vows at Lakeside Church. It seems like just yesterday that I was standing in front of the large church doors, waiting for them to open and walk down the aisle toward my future husband. Time really does fly! 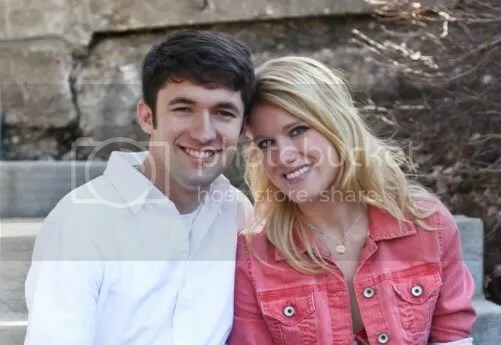 That being said, we have already done and experienced so much in this first year of marriage, I can only imagine what the coming years will hold. 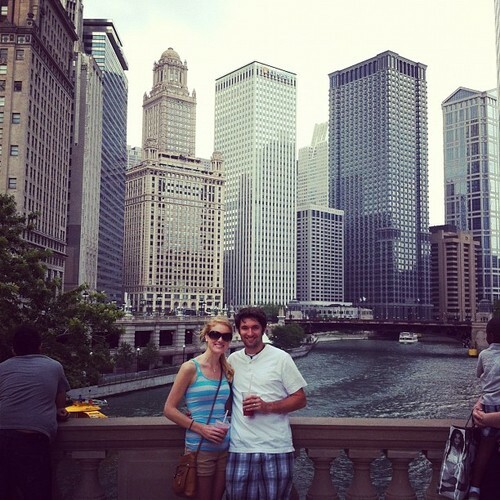 To celebrate our first year, Drew planned for us a long weekend in Chicago several months back. It’d been over a year since either one of us had been in the city and it would be the perfect chance—and time of year since it wouldn’t be during the freezing cold winter—to pay a visit. Our plane landed in the city late Thursday night and after a 30 minute train ride, we arrived at our hotel. From the outside, it wasn’t much to look at, but our room turned out to be quite nice. Even better, it put us right in the heart of downtown Chicago, just a 10-minute walk away from Michigan Avenue and The Magnificent Mile. Too tired to partake in any activities that night, we headed for bed with plans to start the day early Friday morning. 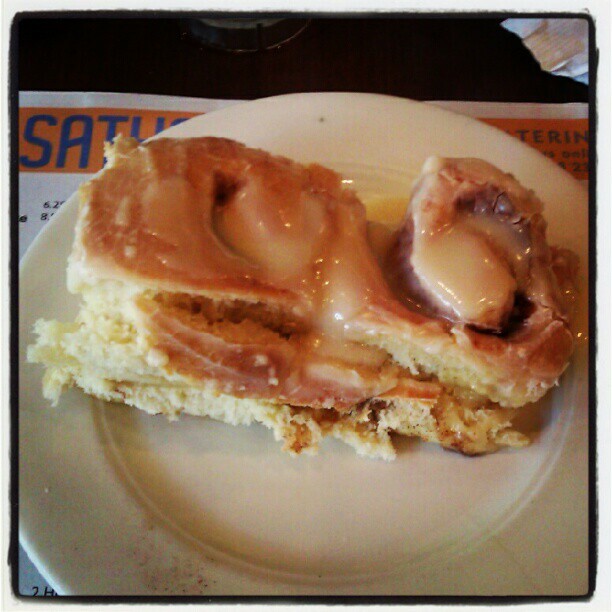 Our first real stop was to Ann Sather, a real institution in Chicago. We’d been together several times before so we knew exactly what to expect: hot, delicious, gooey cinnamon rolls the size of our faces. With full bellies, we walked hobbled along for the next few hours, visiting Wrigleyville and Drew’s old stomping ground. We took a few pictures outside his old apartment; I think he was surprised it hadn’t been deemed unlivable and torn down. Cinnamon rolls the size of our faces. And yes, we ate every last bite. We spent the majority of the afternoon window shopping and browsing downtown. After walking for quite a few hours on our feet, we decided to head back to the hotel for a quick nap before our dinner reservations at Mia Francesca, the Italian restaurant we’d celebrated Valentine’s Day at the two years previous. Our meal at Mia’s was just as good as we remembered it: Drew had his usual chicken and potatoes dish and I ordered the mussels. After dinner we headed to a nearby Irish pub for a few after-dinner drinks and to watch the opening ceremonies of the London Olympics. The bar setting made the experience so much more fun; when it was the United States’ turn to walk the circle, people started cheering and chanting “USA! 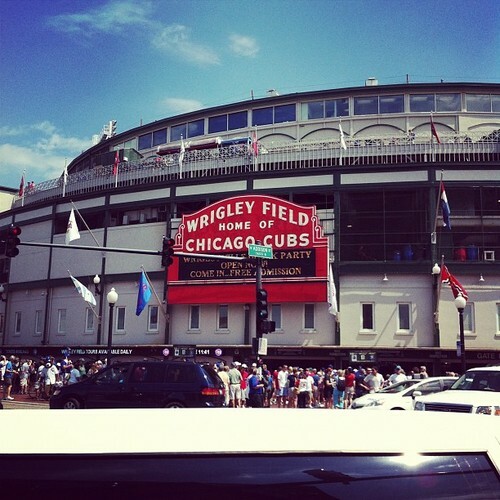 USA!” It was such a fun atmosphere to be a part of, and it capped off our first day in Chicago just perfectly. Saturday morning we had a light breakfast at Starbucks, making sure we had enough room in our bellies for the epic lunch that would ensue later that day: deep dish pizza from Giordano’s. The next few hours were spent exploring Crate and Barrel, talking about how we would fabulously furnish our house if we had an unlimited budget, and purchasing tickets for a late afternoon architecture boat tour. 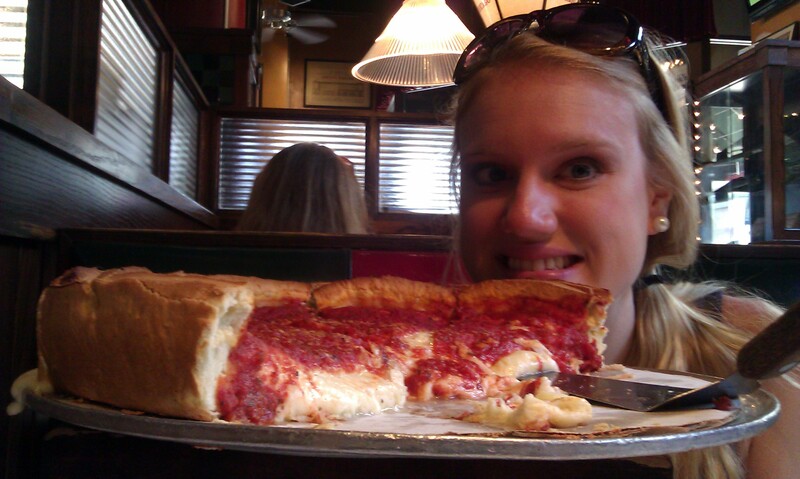 We then headed to Giordano’s to put our name in for a table and order our pizza. I’ve never been to a deep-dish pizza place in Chicago and not seen it packed full with people, so we had a good hour to kill before we were seated and our food arrived. Thankfully there was a bar to sit and enjoy coverage of the Olympics. Unfortunately, do to the poor coverage by NBC, we found out via Twitter that our fellow WKU alum, Claire Donahue, advanced to the finals of the women’s 100m butterfly. Our dismay didn’t last much longer after we had our first few bites of deep dish. Heaven on a plate platter is the best way to describe it really. We couldn’t finish a medium pie between the two of us and as sad at it was to forgo our final two pieces, I knew we’d be hurtin’ for certain if we tried to eat them. We planned our timing quite nicely and enjoyed a drink at the bar next to the tour dock before boarding the boat. 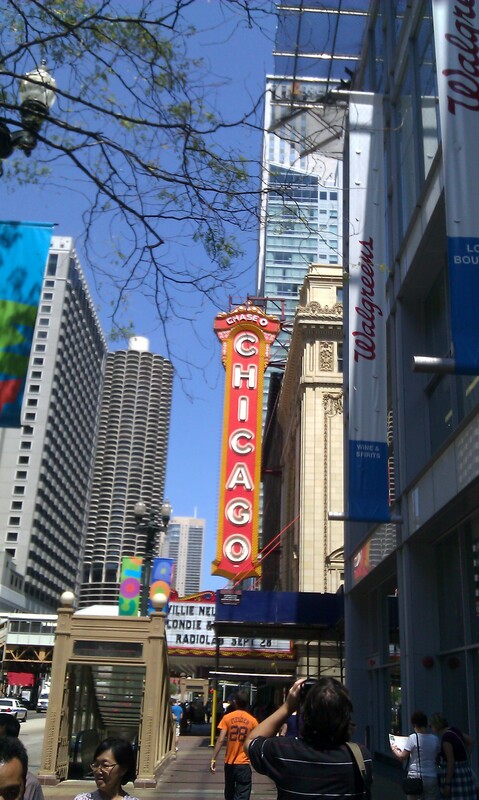 For the next hour we were told all about the history of Chicago’s architecture by an amazing tour guide. We were able to get a lot of good shot on our cameras and saw buildings from angles we’d never have been able to otherwise. Definitely one of the highlights of the trip! That night, since we really couldn’t fathom another meal, we met up with some of Drew’s friends and old co-worker Adam. We started out at an outdoor festival but the rowdy crowd made that a relatively short venture. Next we headed to a Thai restaurant for a a few beers, followed by a place called Violet Hour which Drew and I decided is hands-down the best bar we’ve ever been to. It’s literally a hole in the wall and if you don’t know it’s there, you’d easily miss it. There’s no sign out front and they don’t do any advertising so their clientele is basically formed from worth of mouth (I guess I’m kind of contradicting that policy by blogging about it, ha). The drink menu was by far the most interesting and diverse cocktail list we’d ever come across. I wish I could have taken a picture of our drinks because they were so artfully crafted but the place was dark, relatively quiet for a bar, and didn’t allow cell phones (another reason we ended up really liking the place). One of the stunning views from our boat tour. After sleeping in Sunday morning, we checked out of our hotel and headed out for brunch. Since our flight wouldn’t leave until that night, we had some time to do some last minute tourism. 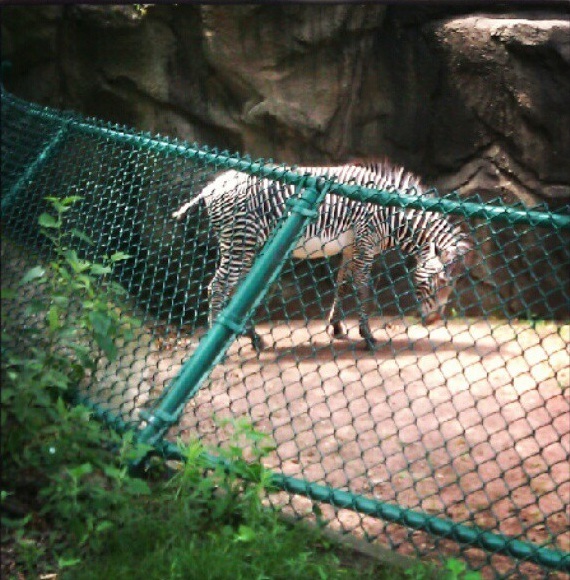 We visited the zoo, where we spotted our favorite animals-zebras, lions and monkeys, oh my. After our visit to the zoo we decided to go ahead and make our way to the airport. It was nice to be able to take our time and enjoy a few drinks and meal before our flight. With the time change, waiting for our luggage to arrive, and train ride home, we didn’t arrive back at our apartment until just before midnight. I’m amazed at how much we were able to do in a short amount of time. 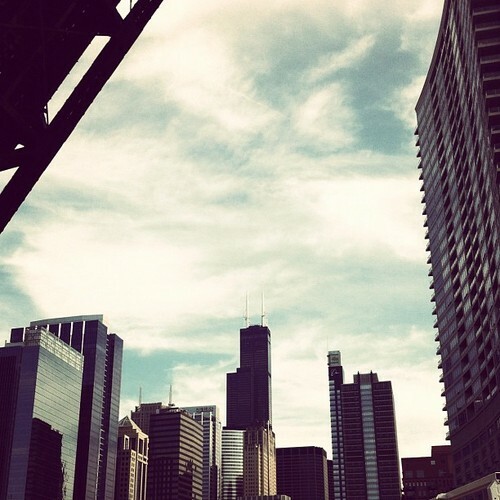 It was the perfect weekend getaway, and we had so much fun reliving our previous stays in Chicago. More importantly, it was great to be able to spend three uninterrupted days together, walking hand in hand through the city. It really reaffirmed this past year for us, as well as made us even more excited for the trips to come. We’ve already started daydreaming about where we’ll go for our 5, 10, 15 year anniversaries. Italy? London? Hawaii? The good news is we have many, many years to see it all! ← The Dark Knight, Lots of Pizza and the Anniversary Countdown Begins! Sound like you two had a blast in Chicago!! I could taste the cinnamon rolls from Ann Sathers and the pizza from Giorando’s as I read your post. I always wanted to go to the architecture tour. 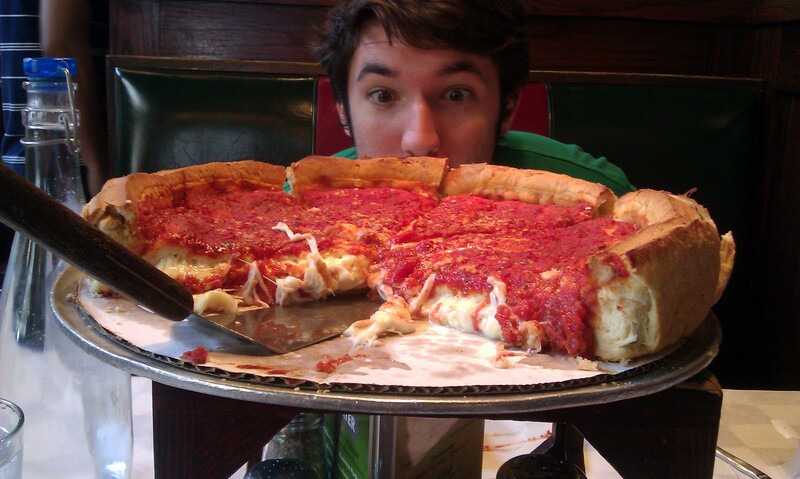 I have also always been a sucker for one of those Giordano’s Pizzas. Sounds like you all had a good time.